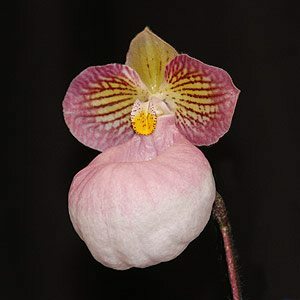 One of the many beautiful slipper orchids, Paphiopedilum micranthum is from the area around the border between Vietnam and China. This orchid is rarely offered for sale however it has been in cultivation since the early 1950s. Flowering in late winter to spring, the flowers are large, attractive and the plants subject to hybridisation, so flower colour and form will vary. Around 30 hybrids are listed on various sources. The flowers are not fragrant, however they make up for that with the outstanding flower form. In cultivation these are best grown in containers or hanging baskets, they are relatively easy care. These are forest dwellers so light is filtered, around 50% shade cloth will give the desired effect. Growing medium needs to be fast draining and it does need to be kept moist. To produce good flowers the plant will need a cool winter with less water, this mimic the natural environment. Winter temperatures need to drop to below 15C (60F) preferably around 8C (46F). Summer temperatures are up to 29C (85F) with nighttime temperature dropping to around 18C. When watering it is important to always use water that has been allowed to become tepid, around room temperature. Very cold water will cause root problems. From spring to summer, watering should be regular, twice a week to 4 times a week depending on growing medium. In winter, when the plat in going through dormancy, watering once a week, or even every second week will be adequate. Never allowing the growing medium to dry. Fertiliser should be used from spring through summer. Use a 1/2 strength or even 1/4 strength specialist orchid fertiliser every two weeks. You do need to water well every week to help flush away excess salts left by fertilisers. Repotting Paphiopedilum micranthum should be carried out every 2 years to avoid the growing medium becoming to water retentive. This is an orchid that is only rarely offered for sale, try eBay or your local Orchid Club or Society.